Stay organized while adding a layer of protection by using this holiday storage solution. Stop worrying about dust, dirt, insects and other problems, and ensure that your wreath is ready to hang when you're ready to decorate. 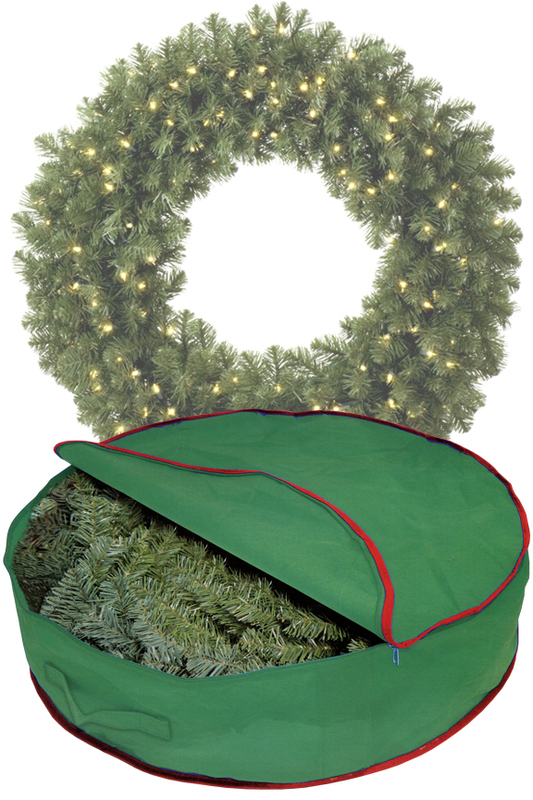 This durable storage bag holds wreaths up to 25 inches in diameter, and it keeps them safe and secure when not in use. The large cover closes with a zipper to ensure that nothing falls out, and it comes complete with integrated handles for easy transport to and from the attic, garage or basement. The large opening makes it easy to take your wreath out, or place it back in at the end of the season, and the sturdy fabric material provides a lightweight case that will last for years. Use it to store and protect one large wreath, several small ones, or similar holiday decorations like garland. It collapses for compact storage when your wreath is hanging, and it expands to accommodate décor up to 7 inches thick when needed. Don't toss it in a closet, or shove it into a crate. Use this simple and effective storage solution to keep it looking like new year after year. Durable. Thick fabric is nicely flexible, but also strong and long lasting. Easily contain large décor items without any worry. Compact. When your wreath is hanging up, simply flatten and fold the bag, and it takes up almost no room. Portable. Thanks to the handles on the side, and the secure closure at the top, you can easily transport this storage case without worry. Bring it with you when visiting family, or just reduce worry and frustration when pulling it out of storage, or bringing it back. Easy Access. Zip it open to reveal a large opening that allows you to remove or replace the contents easily. Large. Other versions will only accommodate smaller wreaths, but this one will easily contain ones that are up to 25" wide..
Versatile. The obvious use is dictated by the name, but this large bag can be used for other décor items too. Easily store and protect large, lightweight items like garland just as easily. Holds wreaths up to 25" in diameter. Measures 25" x 25" x 7". Integrated handles for easy transport. Dimensions 25" x 25" x 7"
Uses Store and organize holiday wreaths to keep them protected in the off season. Compatibility Use with wreaths up to 25" in diameter. Reduce clutter and increase piece of mind. This handy storage bag will protect your wreath from damage during storage, and ensure it is ready to hang when you decide to decorate. Order Yours Today! Multiple protected layers to store up to 64 ornaments in one compact location. Pop open design with added pockets, a section for bows, and the ability to hang or stand. A space-saving design with four accessory pockets and a large compartment for rolls of paper. A durable storage solution to make holiday clean up easy.